When shopping at thrift stores - especially for dated garments with fun fabric prime for refashioning - it is an underlying assumption that you're probably buying something whose former owner is deceased. Sad, but true. 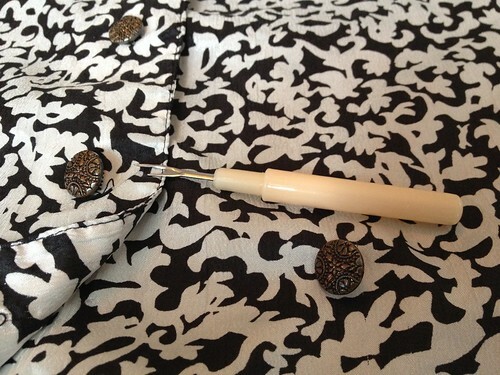 In this case, the name "Lynda" written on the tag of this blouse merely confirmed that suspicion. There are two reason to write your name in your clothes: (a) you're an adolescent going to summer camp, or (b) you're an elderly person in an assisted living facility where everyone's laundry is lumped together. The size and style of this piece told my gut to go with the latter. And the primary reason to donate the clothes of a resident of such a facility? Yep, you guessed it - their passing. Call me morbid, but I kind of like knowing the name of this top's former owner. It gives it a story, a past. 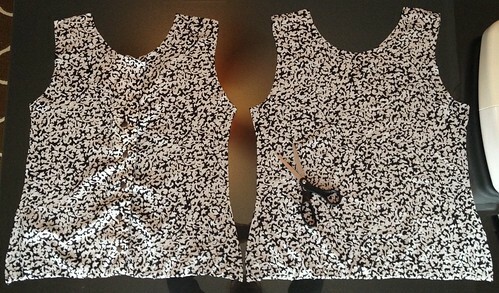 And I hope Lynda, and those she left behind, would be proud if they could see I was able to give her garment new life. 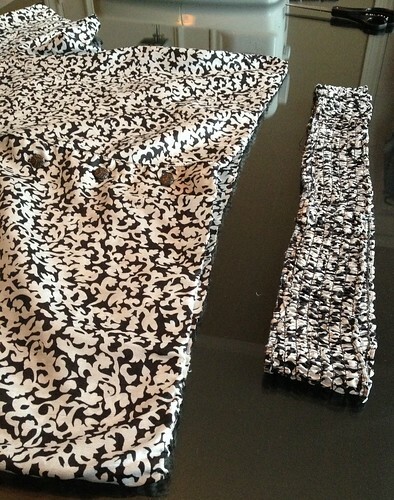 My first step was to remove the elasticized waistband. 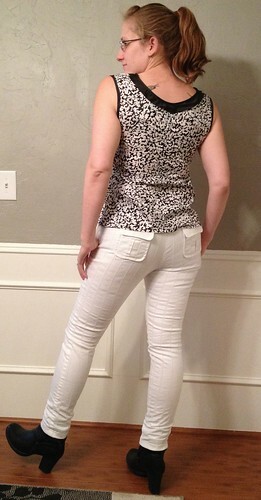 Using my Sorta Sorbetto top as a template, I cut out my front (from the back) and back (from the front). 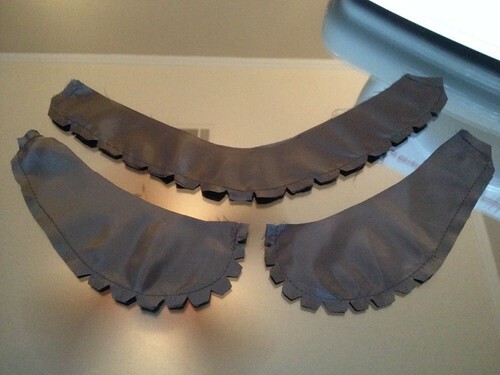 I decided not to do the pleat in the front though, so I didn't cut the front quite so wide. Does that mean this top is going to be a Sorta Sorta Sorbetto? Sure! Unlike when I've flipped shirts around in the past and put the buttons on the back, this time I wasn't going to keep the buttons. 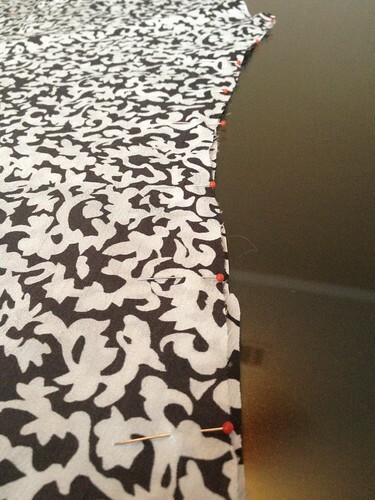 But since I didn't want a seam straight down the front, so I put it in the back. I grabbed my back panel and removed the buttons. 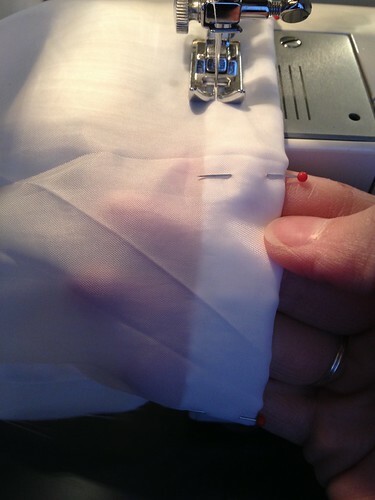 Then I cut out the facing from the button edges, carefully snipping around the button holes. I pinned the two sides of the back together, right sides facing. 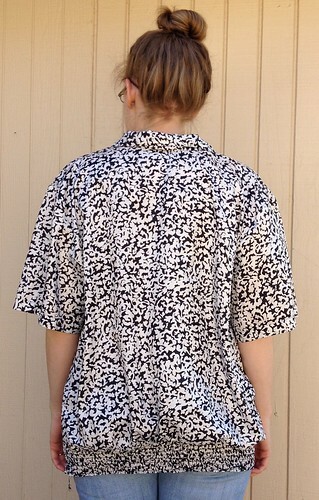 And I sewed just inside the button holes. 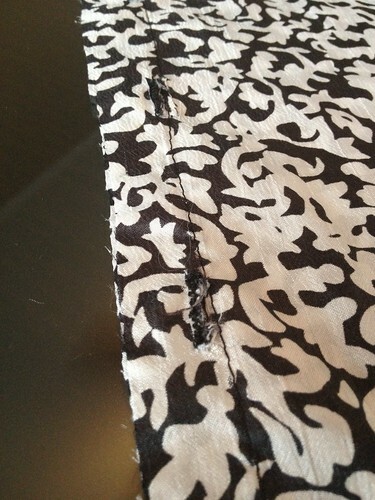 I pressed the seam allowances outward. Then I pressed then under themselves. Next I top-stitched along those folds to encase my raw edges. Here's what it looks like from the outside now. ... and the shoulder seams. I added a couple bust darts coming in from the armholes. To finish the edges and add a decorative collar, I grabbed the remnants from the Sorta Sorbetto project from my scrap pile. 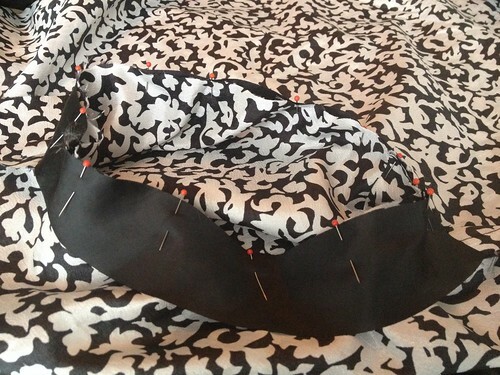 I cut two strips from the skirt lining and pinned them to the inside of my armholes. 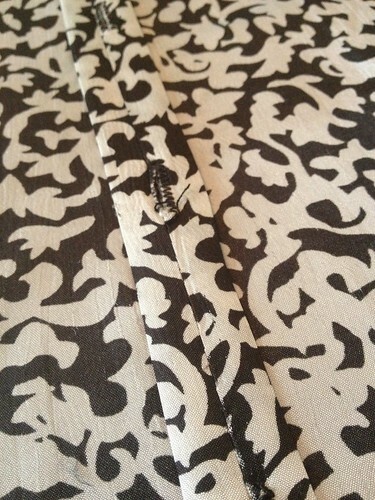 Once those were sewn, I pressed the strips outward, then folded them under again toward the outside of my fabric. 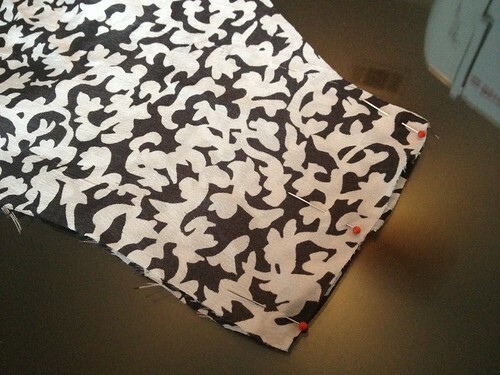 A quick top-stitching and another press and my armholes were finished. 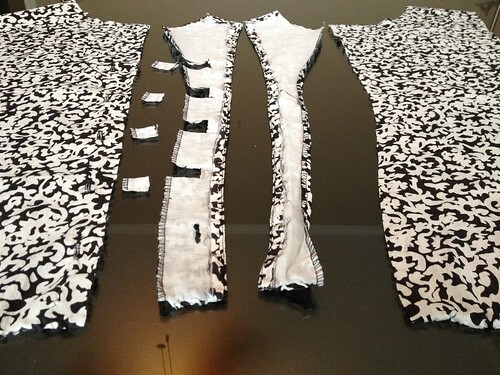 For the neckline, I wanted to something a bit more fancy than just the binding, like the armholes. I've been seeing Peter Pan collars everywhere, and I like the idea of this becoming a cute, feminine piece, so let's do it! 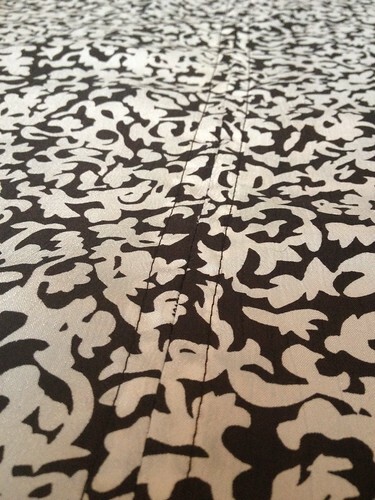 I used a paper bag to draft my pattern pieces. I simply laid my shirt on top of the paper and traced the neck edge. 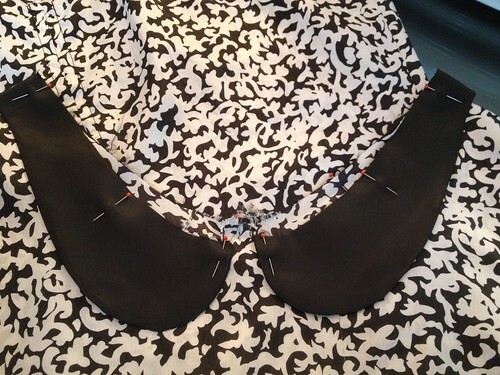 Then I moved the shirt and freehanded the curves of the collar. 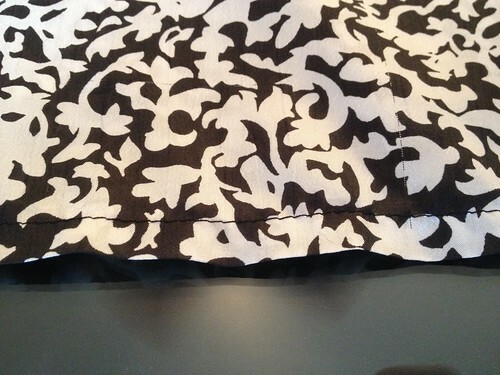 The fabric on the left is folded in half, so I've got four Nike-swoosh-looking pieces and two boomerang-looking pieces. 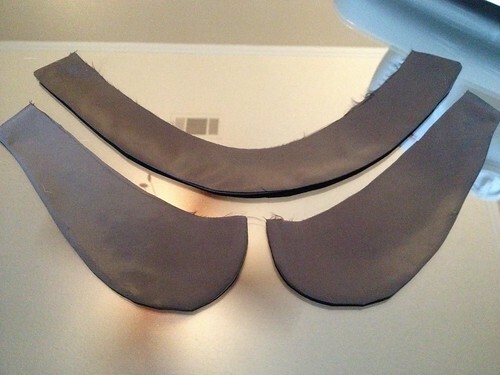 I stitched each pair of collar pieces together along the sides and bottom, leaving the top edges open. Then I clipped the corners and snipped around the curves in order to reduce the bulk when I turn them right-side-out. Once they were turned out, I gave them a good press. They got attached to the neck edge. 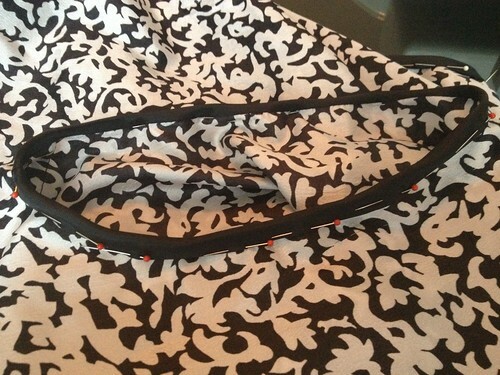 Then another strip was used as a binding, just like the armholes. 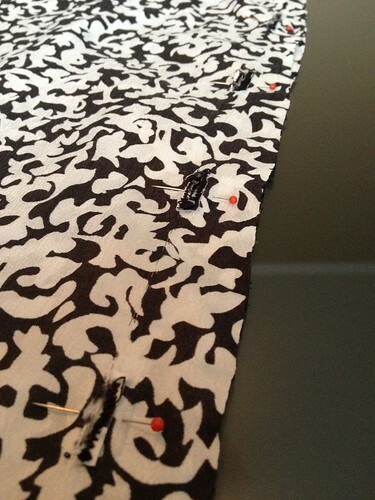 And finally, I hemmed the bottom edge of my new top. Now before I show you the result, we need some pants, yes? Can't go walking around pantsless! 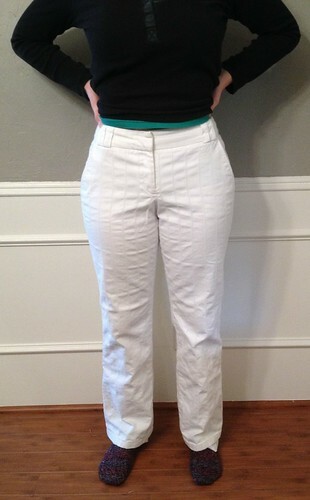 How about these white, wide-leg trousers I picked up at the clothes swap last week? 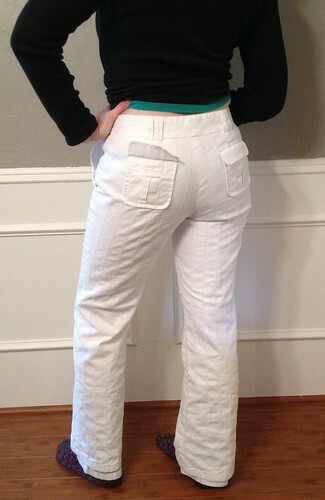 They're my size and fit great in the waistband and booty, but if I'm gonna wear white pants, they will not be wide-leg. The tag on these said dry clean only, but the pants were 100% cotton and the lining (yea for not being able to see the color of my undies!) was 100% polyester. So I tossed them in the machine with the thought that the worst thing that could happen was that the cotton would shrink and the polyester wouldn't. Guess what happened. Yeah, oh well. The skinnifying of pants is fairly straightforward. Having a lining makes it a little more tricky though. 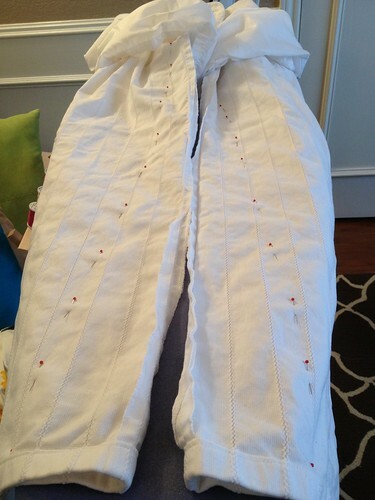 I had to scrunch up the lining around the crotch in order the take in the legs of the outer fabric. 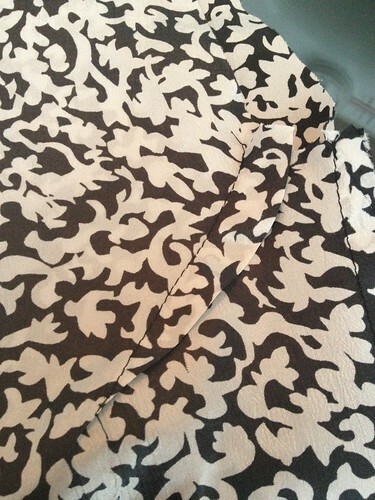 Then, once those were sewn and the excess fabric trimmed, it was pretty easy to see how much lining to take in. 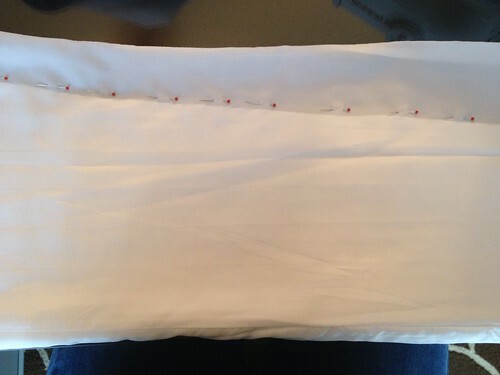 Lastly, I folded the bottom of the lining up a couple times and rehemmed it. It's finally gotten cold here in Texas, plus it's been sleeting off and on, so you get inside pictures today. There was no way I was taking off my coat outside to show off my new sleeveless top. 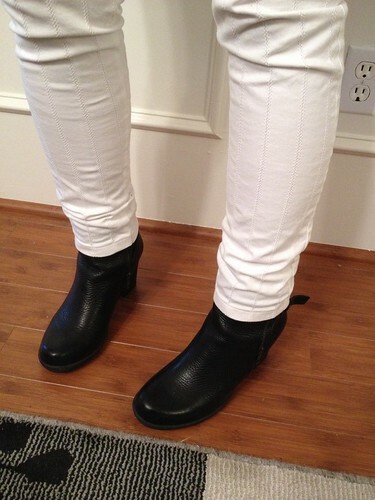 My thrifted black leather boots ($20, but they were brand new with the tags still on, and they're real leather!) 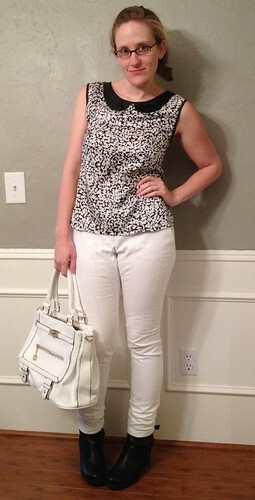 and my new white handbag, also from the clothes swap (yeah, people swap accessories too), coordinate beautifully with my new black and white ensemble! 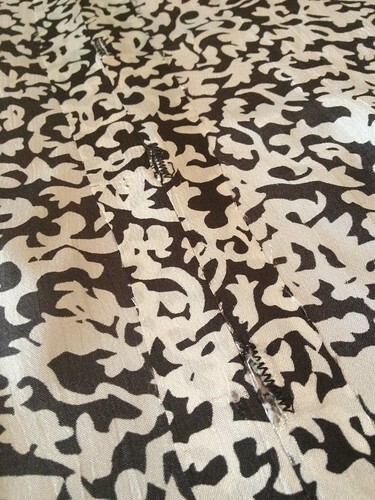 And look, no more exposed lining! Love the top! I don't have a problem with white wide leg pants, though. That's why you're the refashioner and I'm the one who semi-regularly goes to the store in pyjamas. I guess the wide-legs wouldn't have been terrible had they been long enough. 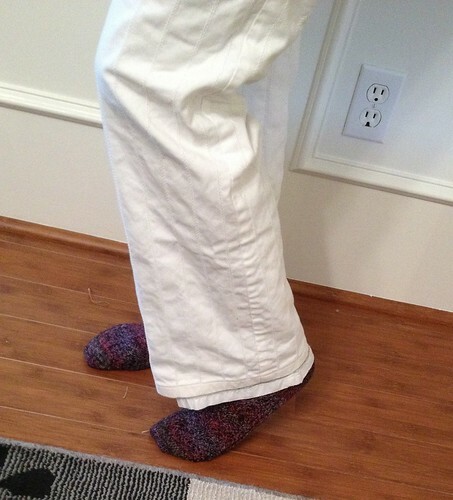 But even before the shrinkage, they were a touch too short for wide-legs. Lynda would be proud, that looks great. A new fresh look. Thanks! I wasn't so sure when I first started seeing them around again, but they've really grown on me! 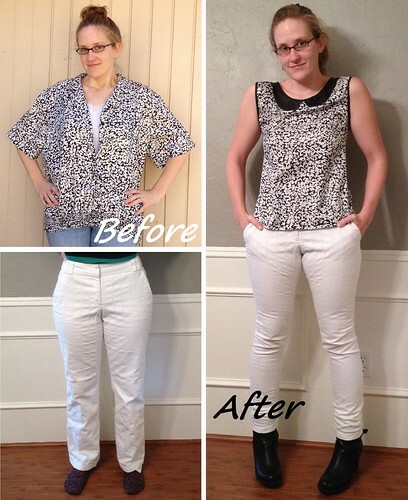 wow...you are getting so good at refashioning clothing. It's really impressive. How long did it take to fix this outfit the way you envisioned it? Thank you, Amy Jo! Most of the time for the top was just spent staring at it and trying to figure out what it wanted to be. 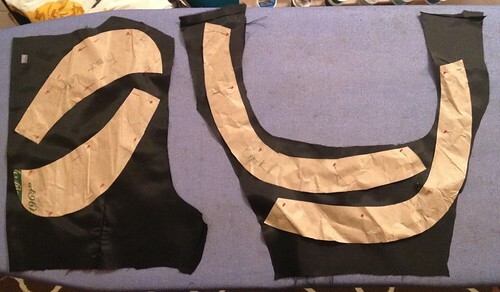 Once I had that, the actual cutting/sewing maybe took... 3 hours? It wasn't all at once, so it's hard to say. The pants were only about 30 minutes. Nice! 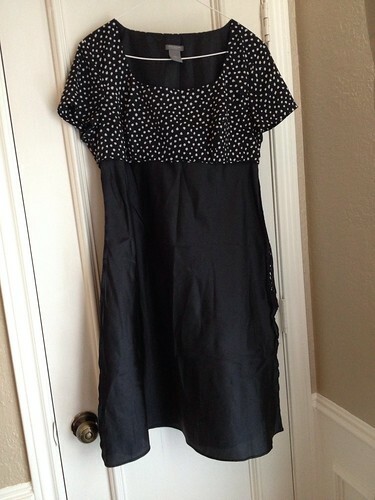 I really like feminine styles so this top appeals to me. I've been meaning to ask how long it takes to figure out and sew your refashions, too, so I'm glad Amy Jo asked. Thanks, Jenny! I'm not a very girly girl, but pieces like this are the ideal balance. I can wear a sweet top with jeans and feel comfortable but still cute. Perfect! Laika hasn't even been in the craft room yet. She mostly stays in her room behind a baby gate. We've got an enclosed sunroom (originally a back porch when our house was built), which has no carpet and lots of windows to the living room, breakfast nook, and master bedroom for easy puppy-surveillance. When her bladder and bowels are freshly emptied, we let her out into the main living/dining/kitchen to run around, but always under close watch as everything is still a chew toy to her. Since these areas of the house are still new and interesting, she hasn't even bothered to explore down the hallway. That's probably a good thing given how much there is for her to get into in my craft room and my husband's office! Totally cute. I would be surprised if the sewing machine had freaked the puppy, pits are very unflappable. As long as she can be with you, she'll be super happy even if you are using a jack hammer. Mine used to follow me from room to room when I did laundry. He would lay down to watch me, and then sigh loudly when he had to get up to follow me into the next room. It was amazingly funny. Well, she doesn't like the television, so I wasn't really sure what to expect. But it could just be that we want to watch tv in the evenings when she's getting tired and cranky. I imagine some of that will get better with age and as she gets used to her new environment. That's the beauty of refashioning cheap thrift store garments - you don't feel too guilty about tossing it if things don't go according to plan! You did a wonderful job on Lynda's top. I love the slight scoop in the back. Thanks, Theresa! That scoop is the result of the original neckline being lower in the front, since I turned it around and made that my back. I like it too though, especially how you just get a little peek at my tattoos! Great new outfit! 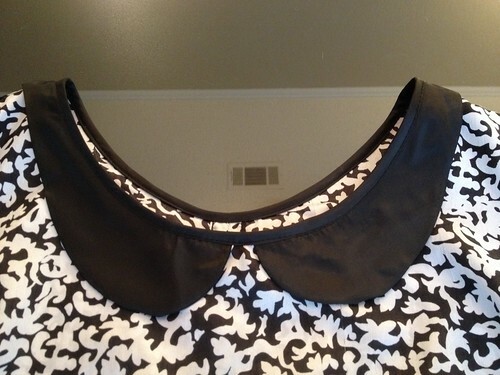 I love the peter pan collar detail! Thank you, Heather! I'm quite pleased with how it turned out! This top is adorable, and thank you for the pant tutorial. 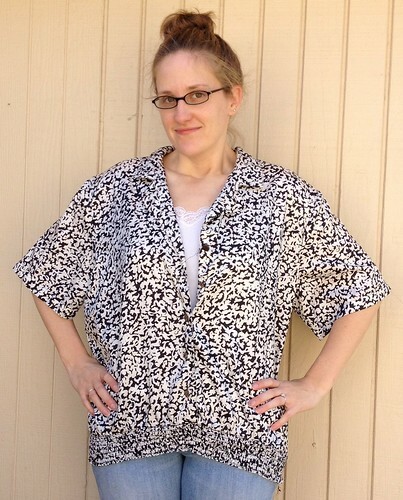 I have two pairs in my refashioning stash that I need to skinny up. Hope you had a wonderful Thanksgiving! Thanks! I have a couple pairs of jeans to do this too as well. I just never seem to get around to them all.